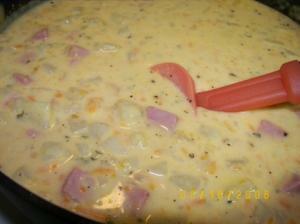 Nice thick, cheesy potato soup with ham. Be sure to read all my notes! Misc Notes from AllRecipes reviews: Add garlic to onion & potato mixture. Some added carrots or corn. Several used chicken broth rather than bouillon cube & water (and most said it needed more broth, very thick). Can garnish with bacon & green onions to make it more like a baked potato soup. Maybe a dash of thyme.